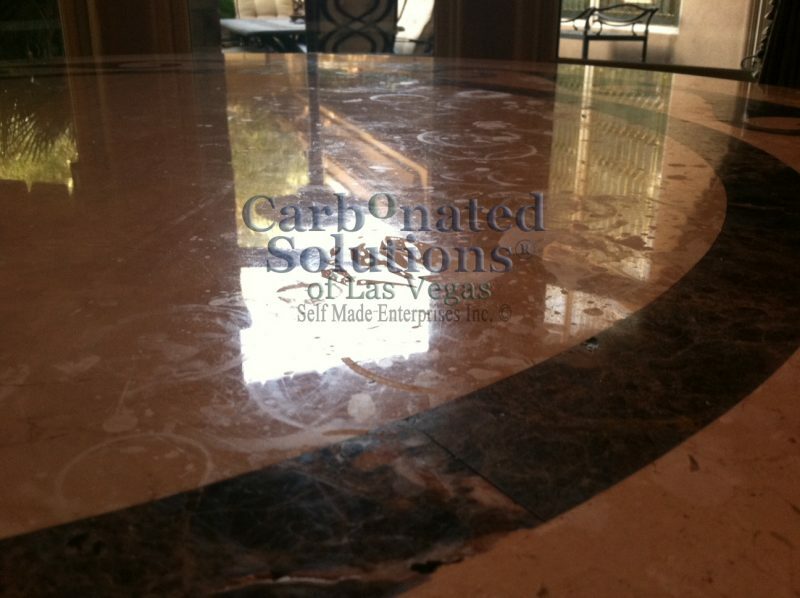 If ev ery day wear and tear has removed luster from your natural stone it’s time to call Carbonated Solutions of Las Vegas. Our natural stone cleaning technicians can correct most of the everyday problems that can rob the beauty of your natural stone. Precision restoration – diamond grinding, resurfacing and polishing to restore natural luster of marble, travertine, granite, and limestone, on floors, walls, counter tops, showers, vanity tops and bars. Stone Polishing – Using specially formulated polishing powders we polish your marble, travertine, or any natural stone floor, to it’s original polish and luster. Natural Stone Honing – Removes scratches that have marred your marble finish as well as removing etching from acid or heavy alkaline damage. Stone Filling Holes/Repairs – in travertine, marble, and other natural stones. Natural Stone Grinding – Using diamond abrasives removes lippage, deep scratches and makes surfaces flat. Natural Stone Crystallization – Is a chemical transformation of the floor surface, very much like the conventional polishing of marble from the factory. Crystallization is to be used indoors only. It is used to achieve the ultimate finish with a real mirror appearance that not even the best polished marble and travertine floor can have. Dust will have nowhere to adhere and maintenance will be reduced to a minimum. Stone Sealing – Protects both the natural stone and grout by applying a protective seal to resist and repel water, oil and dirt from penetrating the surface. Natural Stone New Installations – Let our professionals remove grout haze, thin-set/mortar, & construction debris. We will also give you professional advice on cleaning , polishing, crystallizing, and maintenance. Scratches, stains, foot abrasions, acid, moisture, improper maintenance procedures and alkaline can all ruin your marble and natural stone floors. Proper maintenance of your marble and natural stone surface is essential. Natural stone maintenance will help retain its magnificent beauty and save you money on restoration and replacement costs in the future. Prolong the life and beauty of floors surface by following routine maintenance options that will help keep them in excellent condition. The most destructive material to any stone surface is a combination of sand, dirt and annoying scratches that significantly dull the surface of your flooring system. A daily routine of dust mopping is essential in keeping your floors looking its very best. Dry mopping will help keep the stone surface clean and extend the period between restorations. Placing walk-off mats adjacent to entrances will help eliminate sand, dirt and other elements that will be destructive to marble, travertine, and all natural stone surfaces. If you can prevent the damaging effects of sand, dirt and other elements from harming the stone surface, you will be able prevent the scratches that dull the surface. Spills from drinking liquids or food containing acid will cause dull marks to form on your marble and stone surfaces. Cleaning products containing acid and high contents of alkaline or bleach will also damage natural stone surfaces. This causes them to lose their shine and luster. In order to prevent harming natural stone surfaces, use only natural cleaners or stone soap liquid specifically formulated for natural stone. It will be beneficial to protect the floors with a quality sealer in an effort to reduce marks and scratches that will dull the surface. Sealers will also help to prevent stains and moisture from penetrating into the natural stones surface. Not employing a consistent use of dry dust mopping may cause a decrease of shine. It may be a good idea to establish a yearly maintenance program in order to renew the shine. Especially when the floor is subjected to medium or heavy traffic. You may also use a damp mop on your floor at least once or twice per week to remove sand and dirt. This will help to reduce potential dull marks and scratches. Do not use hot water as it will cause the floor to streak. for your free home or business estimate.